Men's faces do not often show the signs of aging as much as women's. 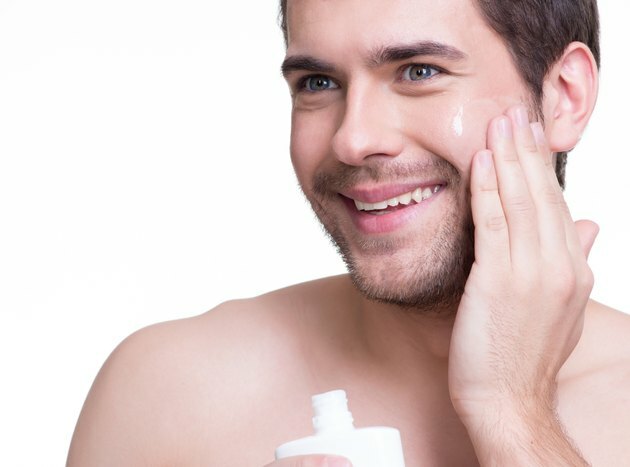 According to dermatologist Nicholas Perricone, M.D., men's skin is 20 to 30 percent thicker than women's, making it less likely to sag and develop fine lines. However, this does not make men exempt from getting wrinkles. If you find that those pesky lines have begun to creep onto your face, take charge to help diminish them and ward off future wrinkles. Use skin care products designed to reduce the signs of aging and enhance your skin's firmness to achieve a more youthful-looking complexion. Wash your face in the morning with a non-drying cleanser. While your skin is still damp, apply a preshave oil, which Eric Malka, the president and CEO of the Art of Shaving, notes will soften your skin and help you achieve a closer shave. Look for a product that contains soothing botanicals to help reduce razor burn, and allow it to absorb for a minute or two before moving on. Apply a moisturizing shaving cream to your face. Dermatologist Ted Lain, M.D., says that shaving daily will help exfoliate your face, getting rid of dead skin and encouraging cell turnover, all of which will help refine your skin's texture and lessen fine lines. Use a sharp blade to remove your hair, and then rinse off and pat dry. Slather your face with a sunscreen that contains vitamin C. Lain states that this combination of SPF and antioxidants will ward off the most sun and environmental damage and help keep the signs of aging from showing up on your face. Choose an oil-free product and apply it generously, using as much as needed throughout the day. Clean your face again at night, and then give yourself an extra dose of exfoliation by using a gentle scrub once a week. Dermatologist Kathy Fields, M.D., notes that your pores can become larger as you get older due to sun damage and skin sagging. Massage a dime-sized amount of product into your skin to help clear out your pores, and then wash it all off and pat your face dry. Put on a retinol cream every night. Dermatologist Hilary L. Reich, M.D., says that this product will enhance your skin's collagen production, giving you even firmer, more supple skin and diminishing wrinkles. It will also improve the texture and tone of your complexion. Smooth the cream all over your face before bed.